Good Enough was a first hand account of Riley's inpatient treatment as she began her recovery from anorexia. It's been over 25 years since my inpatient treatment for disordered eating, but Petro-Roy's depiction of Riley's battle with ED (eating disorder) immediately brought me back to my own struggle. I applaud the author's decision to write this story in journal format, because it was the perfect way to clearly capture and communicate Riley's emotions. She skillfully depicted the sadness, loneliness, anxiety, desperation, and shame that results from this disease. She explored the secretive nature of it, and how it forces the one suffering from the disorder to withdraw from their life. Riley often lamented giving up things, activities, and people who made her happy in order to protect her secret. This part was so honest and really hit home with me. I loved the way Petro-Roy laid out Riley's recovery as well. I don't think people realize how difficult it is to wage a war with an eating disorder. Someone suffering from anorexia or bulimia NEEDS food to survive. They need to make peace with this enemy, and it's a very, very difficult thing to do. Riley's struggle was authentic, and because of that, her recovery was not all rainbows and unicorns. It was difficult, and it was hard work, and this was addressed very well in the book. Another thing I personally connected with and, thought was done really well, was the way Riley's family and friends reacted to her illness. I remember my own sister coming to visit me in the hospital, and asking me, "Why can't you just eat and be happy?" This must be a common response, because Riley met with the same line of questioning. There were a lot of other reactions from her friends and family, which aligned with my own experiences, and I really appreciated that some time was dedicated to this in the story. Finally, it was extremely rewarding to watch Riley progress. The war against ED is fought on the battlefield of the mind, and this can be a very difficult place to win any skirmishes. That push and pull of conflicting emotions and clashing wants and needs were omnipresent in Riley's story. I was so proud of Riley as she fought back against the negative and tried to embrace the positive. I was also proud of the way she opened up and began to assert her wants and needs to her family and friends. All were such important parts of her recovery. When I started this book, I immediately thought it brilliantly captured the emotions and experiences of someone suffering from an eating disorder. When I finished the book, I thought it would be a fantastic book for the friends and family of someone with this illness, because it would give them great insight and maybe help them understand what it's like to have an eating disorder. Overall: A wonderfully written and emotional look into the mind of a young anoretic as she works towards recovery. Twelve-year-old Emily is flying with her parents to China to adopt and bring home a new baby sister. She's excited but nervous to travel across the world and very aware that this trip will change her entire life. And the cracks are already starting to show the moment they reach the hotel--her parents are all about the new baby, and have no interest in exploring. In the adoption trip group, Emily meets Katherine, a Chinese-American girl whose family has returned to China to adopt a second child. The girls eventually become friends and Katherine reveals a secret: she's determined to find her birth mother, and she wants Emily's help. New country, new family, new responsibilities--it's all a lot to handle, and Emily has never felt more alone. After twelve years as a family of three, Emily's family was preparing to become a family of four. Emily was a 12-year-old with aspirations of winning a photo journalism competition and lots of worries about her trip to China to meet her new sister. Would she survive her first plane trip? Would she like the food? Would she like her sister? Would her sister like her? I had no need to worry though, because Emily and her family were able to work through all these issues and more during their journey. Foreign adoption has become quite common in the US, and I enjoyed reading about the process. I appreciated Franklin sharing her personal experiences, and the first hand knowledge really showed, as she included many details, that were previously unknown to me. She shared the positives and some of the negatives, but what I really loved, was the different points of view she gave us. The story was told by Emily, and therefore, the bulk of the experience was told from the adoptive family's perspective. Franklin did a wonderful job helping us navigate Emily's emotions. They came across as very real and reasonable, and I loved the way she and her family worked through all her feelings. But we didn't only get the perspective of the new parents and the new sister, we also got to see this whole trip through the eyes of someone, who had previously been one of those babies - Katherine. Katherine was not as easy to like as Emily, but once I started learning more about her emotions regarding being back in China and her adoption, my heart ached a little for her, and I wanted to give her a great big hug. 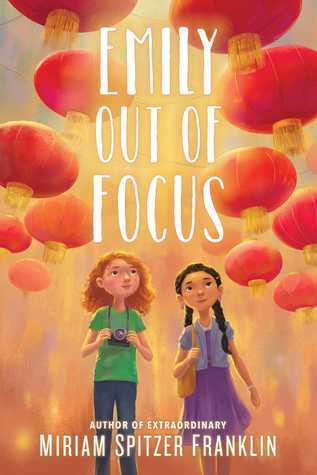 Overall: A sweet, touching, and realistic look at foreign adoption, which brought us to China, and helped us see it through the eyes of a new, pre-teen sister, as well as an adoptee. middle grades books you have read? The cover for that 2nd one is so precious! It looks like an interesting and relevant topic too. Glad it was explored well. It perfecting captures one of the scenes described in the book too. And, I must say, Franklin took us on some very picturesque tours while we were in China. Both of these sound awesome and important. I’m adding them to my list. Also, the cover of Emily Out Of Focus is adorable. Great reviews! I honestly requested the book, because of the cover, but I also really enjoyed the story. I don't middle grades books always come across so well for me. I am trying to read more middle grade and have really been impressed by what I have read. These both sound like outstanding books. Thank you for your very personal review of Good Enough. Mental health rep is the only rep I feel comfortable commenting on, because of my vast experience in that world. Both were very good, and I know there is an audience for each of these books out there, because the authors did such a good job with the topics. "Why can't you just eat and be happy?" is like asking a depressed person "why can't you look at the good things in life?" Sorry to hear you had to deal with this Sam! I'm glad you brought Good enough to my attention. I'm always looking for good books about eating disorder since I read Wintergirls. Have you read it? I was 21 during that hospitalization, and I had been in and out of therapy starting at age 7. They didn't call me "Sam Black Cloud" for no reason, and my sister was always exhausted with my "moods". Most people, who have never been chronically depressed really understand what people are going through, which is why I think Good Enough would be an excellent resource for family members of someone suffering from ED to read. I have not read Wintergirls, but I have heard that Anderson did a magnificent job with the subject matter. First, I’m really sorry to see that you struggled with an eating disorder you’re self, Sam. That’s scary and I can’t imagine the inner strength it takes to overcome that. A smoker can just quit smoking, a drinker can just quit drinking. But there is never, ever any getting away from food. So, kudos to you for that, my friend. 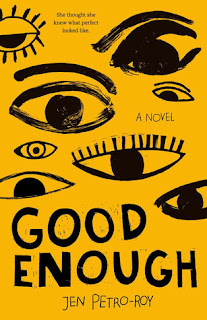 Good Enough sounds like a really powerful read and an important one. My first thought was surprise at a 12 year old MC but I imagine ED’s are manifesting in kids younger and younger now. I like how it could be helpful for both someone dealing with an ED as well as those trying to offer support. I think it's hard for people, who have never been owned by an addiction to really understand any sort of addiction, and trying to explain is just too tiring. I was in treatment for over 13 years for my eating disorder, and over 35 years for my depression. It's a day by day thing. And yes, all sorts of mental illnesses are manifesting in younger and younger children, and I am glad books like this exist for them. Maybe they will see themself or a friend and seek help. I am sorry to hear you have dealt with a ED. I too have one just on the opposite spectrum. ED is a real disease and it isn't talking about enough and it is leaning towards gay males now. More and more men are being diagnosed with ED. It's such a shame that we (parents/society/people in general) focus on our looks so much and the negatives. I am no expert. But, I admire you for talking about your ED and talking about a book about it so maybe more people like me understand it. The emotional, physical, and psychological that is in this. Hugs to you! When I lived in Florida, everyone I knew was having some "procedure" done at the plastic surgeon. It's still a reality that attractive people are more successful, and the beauty standard will not disappear overnight. Great reviews! That first book sounds like such a powerful and important read. I agree that it sounds like it would be a great read to help family and friends better understand what's going on in the mind of someone who has an eating disorder. I also like that this topic is being touched on at the middle grade level. I think there were always a few authors out there, who wrote those "tougher" books for this age group, but I am glad that more and more authors are also doing it, because I feel like our kids "grow up" a lot faster than I did these days. 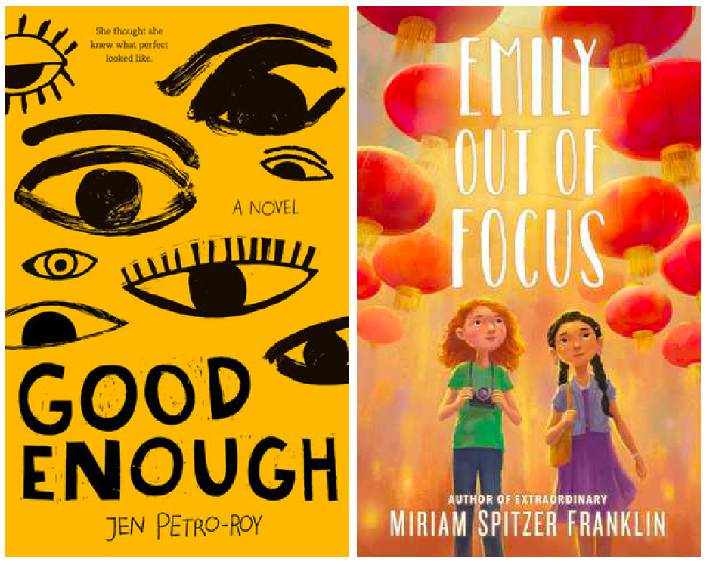 I read some middle grade and I do like that cover for good enough. I always thought middle grades would read too young for me, but once I started I couldn't stop. I actually think MGs authors have a better delivery than I sometimes see in YA books with "issues", and they are usually really heartwarming too. I don't really read middle grade as the age audience is not one for me but I do try and delve in from time to time. But I am glad to know there are books facing topics which are so important such as adoption and eating disorders. It saddens me that people so young are going through eating disorders (or people are going through them at all, really) but with the media nowadays and such I am not surprised. I am glad that you really appreciated these books, Sam! I used to think I was way beyond the age range for MG, but then I read some, and there are some really amazing MGs books out there.